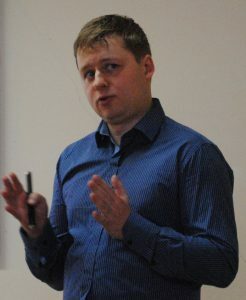 On March 17, 2016 successful defence of a PhD thesis by Andrey Osetrov, our colleague, took place. The thesis is entitled “Method of bending and vibration problems of shallow shells solution based on R-functions theory and spline-approximation”. Supervizor of the work – Head of the Department Prof. L.V. Kurpa. Our warmest congratulations to Andrey and Prof. Kurpa!